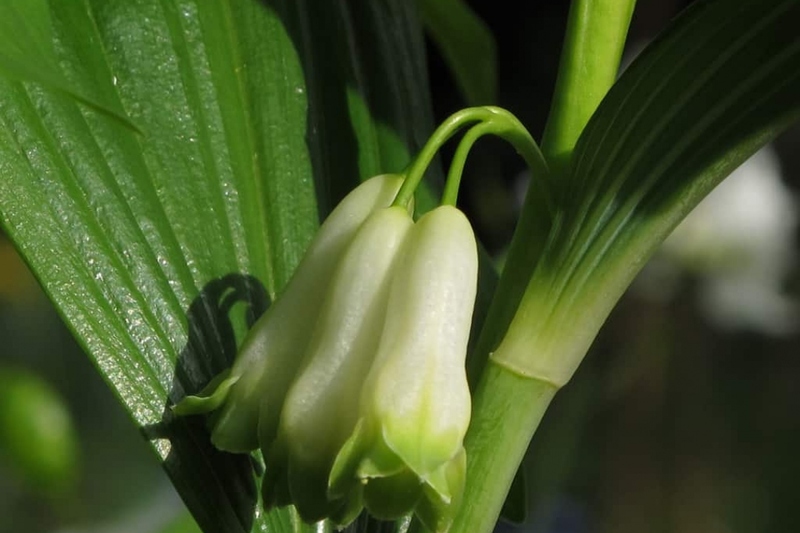 Angular Solomon's-Seal (Polygonatum spp. ): growing, planting, caring. Large arched stems with bell-shaped white flowers in Spring. Scientific name : Polygonatum spp. Full description for Polygonatum spp. not yet available. Yum, beautiful big leaves! The slugs are not mistaken, and if they have a small hunger you will see the signs of their passage ... As usual, our advice is to anticipate by placing an offering at the other end of the garden. NB: Slugs are particularly attracted by young dead leaves, plants of the cruciferous family, and especially beer. Be careful in the latter case, you may attract all the slugs of the neighborhood ... it's like opening a free bar at the exit of a victorious stadium. Plant your salomon seal in acid soil - undergrowth often - light, drained, rich. The sunshine should not be hot, but otherwise these perennials withstands everything. Prepare the soil by digging (to decompact it, with a pitchfork or a broadfork), scratching and raking. Plant with a spacing of 50 cm between the plants. Tamp the soil so as not to let air in contact with the roots, then water abundantly. The first month after planting, water twice a week. Then you will only need to water in case of drought, or if you have planted in dry soil. Well, if your Seal of Solomon is happy, the question of its multiplication will not really arise ... its rhizomes will automatically accomplish all the work. Take a piece with the spade in late summer, and voila! Mulching these perennials will save you from watering and weeding and will even fertilize the soil a bit as it decomposes. Polygonatum will appreciate pine needles or pine wood chips. Mulch with a thickness of at least 5 cm to provide a good level of efficiency.